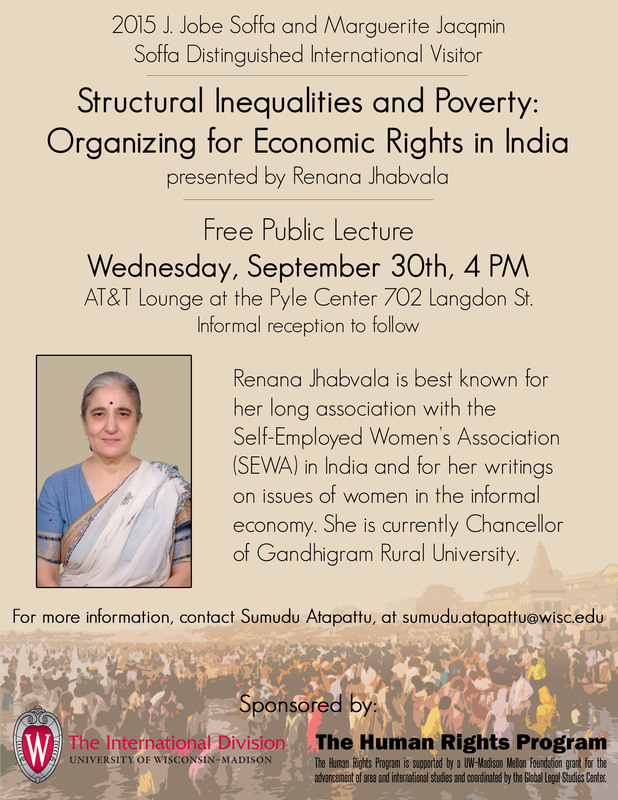 Jhabvala, who has been extensively involved in policy issues regarding poor women and the informal economy in India, will discuss “Structural Inequalities and Poverty: Organizing for Economic Rights in India,” on September 30, at 4 p.m. in the AT&T Lounge at the Pyle Center, 702 Langdon St., on the UW–Madison campus. The lecture, free and open to the public, is sponsored by The International Division and the Human Rights Program at the University of Wisconsin–Madison. Jhabvala, chancellor of Gandhigram Rural University, is best known for her long association with the Self-Employed Women’s Association (SEWA), a movement of 2 million women who have organized for economic rights and in the process are changing economic and social structures. She represents SEWA at the International Labour Organisation (ILO) and other international settings. In her lecture, she will talk about the structural economic injustices faced by the poorest working women and the experiences of SEWA. For more information please visit the Division of International Studies website.